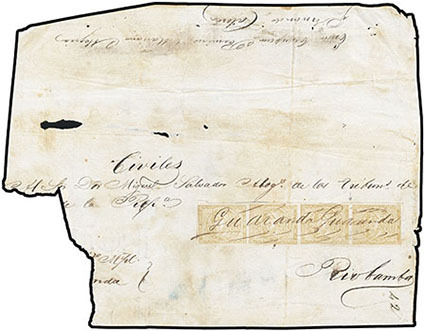 Ecuador, 1865, 1r Bistre Olive, position 71 showing colorless line in bottom right spandrel, near complete strike of Latacunga boxed cancel, clear to mostly large margins, an Extremely Fine strike, this handstamp was provisionally introduced in 1865 before the arrival of a date stamp. Scott No. 3 Estimate $100 - 150. Ecuador, 1865, 1r Bistre Olive, Horizontal Strip of Six, Strip of Three and Pair, all tied by neat dotted lozenge cancels on oversized Judicial front with backflap to Riobamba, with pair at left additionally tied by matching "Latacunga, 19 Juil, 66" cds, red crayon "22 oz" weight endorsement at center, Very Fine, believed to be the largest known multiple usage of the 1r in the bistre olive shade, ex-Olgieser. Ecuador, 1865, 1r Bistre Olive, Horizontal Pair, full well balanced margins, canceled by neat "Guaranda, 6 Mai, 1866" cds on wrapper front with part back to Ambato paying the quadruple parcel rate, Very Fine, an early usage of this scarce shade, ex-Saá and Longhi; with 2011 Moorhouse certificate. Ecuador, 1865, 1r Bistre Olive, Horizontal Strip of Four, clear to large margin, light pre-use horizontal crease, each stamp with manuscript "Chimbo" tying strip on partial front to Riobamba, manuscript "7½" weight endorsement at top, Very Fine, less than ten usages are recorded with this cancellation, ex-Olgieser. Ecuador, 1865, 1r Bistre Olive, Vertical Strip of Four, positions 16/25/34/43, position 43 showing double frameline at top, clear to large margins, tied by manuscript "Guaranda" cancels on part Judicial cover to Riobamba; top stamp with light corner crease, F.-V.F., ex-Saá. Scott No. 3 Estimate $200 - 300. 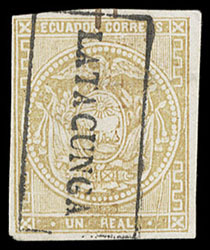 Ecuador, 1865, 1r Yellow Buff, Irregular Block of Ten, third printing, positions 31 / 40 / 49 / 58 / 67-68 / 76-77 / 85-86, in combination with 1865, 1r orange, block of six (first printing, positions 73-75 / 82-84) + ½r deep blue on blue on Judicial cover to Ambato, all tied by red dotted lozenge cancels with matching "Riobamba, Franca, 25 Ene, 73" cds alongside, manuscript "32¾" oz weight endorsement at upper right; vertical file fold affecting one 1r yellow buff stamp, still Very Fine, ex-Goeggel; with 2014 Moorhouse certificate. Scott No. 3+4+2c Estimate $3,000 - 4,000. AN EXCEPTIONAL MULTIPLE FRANKING BEARING TWO DIFFERENT PRINTINGS OF THE 1 REAL YELLOW ISSUE. The late usage in 1873 of a first period printing may be explained by that of new supplies of later printings being placed on top of the remaining first period holding. Ecuador, 1865, 1r Bistre Cinnamon, Two Horizontal Strips of Four and Single, in combination with 1865, ½r blue on oversized Judicial wrapper to Riobamba, all tied by dotted lozenge cancels and matching "Latacunga, 23 Nov, 65" cds, red crayon 19 oz weight notation below, Very Fine, ex-Wolner. Scott No. 3+2 Estimate $750 - 1,000. Ecuador, 1865, 1r Cinnamon Olive, Vertical Pair, tied by "Guaranda, 15 Oct, 65" cds and manuscript "4 oz" weight endorsement on Judicial front to Riobamba, turn use with reverse addressed to Guaranda franked with 1865, ½r blue + 1r green pair and tied by "Riobamba, 18 Oct, 65" cds's, Very Fine, ex-Olgieser. Scott No. 3+2+5 Estimate $500 - 750.